For 30 years Sterling Sound has been a facility exclusively dedicated to the art of mastering. Sterling Sound has one of the most experienced and diverse engineering staffs of any studio in the world. self-contained, surround-capable suites and private client lounges. NEW YORK CITY - Sterling Sound, the world-renowned mastering facility staffed by the most accomplished engineering team in the industry, has completed its move to the Chelsea neighborhood of New York from its former premises in Midtown. The move fulfills the long-range vision of Sterling president Murat Aktar, chief mastering engineer Ted Jensen, and senior mastering engineers Greg Calbi and Tom Coyne, who purchased the studio in 2004. Concurrent with their management buyout, the new Sterling team acquired a 25,000-square-foot floor atop the bustling Chelsea Market and announced plans to build a state-of-the-art facility that would accommodate the needs of staff and clients alike. Three years later, Sterling Sound Chelsea opens its doors as the world's premier mastering complex, with seven full-service, surround-capable studios, separate production/editing rooms, and private lounges." When we took over Sterling in 2004, we set out to build the most sophisticated, creatively stimulating, and client-friendly studio we could imagine, says Aktar. "We're proud to have accomplished that, and are grateful of the team of architects, engineers, acousticians, and contractors who brought it all together for us." Jensen, who - along with Calbi - relocated to Chelsea after the first phase of construction in February 2000, says, "Greg and I have been in our new rooms for almost two years, and we've been looking forward to having the rest of the guys here. As much as mastering engineers work in private with their clients, there's nothing like having a team atmosphere among the staff." 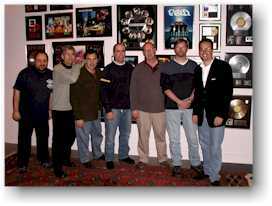 Besides Jensen, Calbi, and Coyne, the Sterling engineering team consists of senior mastering engineers George Marino (a 28-year Sterling veteran), Chris Athens and Chris Gehringer; mastering engineers Steve Fallone, Dominick Maita, and UE Nastasi; and chief technical engineer Chris Muth, who built the studio's proprietary analog transfer consoles, preamps, and signal processing equipment. Marino and Gehringer moved into their new suites in December, while Athens' and Coynes' rooms were ready in early January. With the relocation of its staff complete, Sterling has closed the Midtown facility. However, Sterling's DVD authoring partner, Metropolis DVD, will continue to occupy its current Midtown space until later this year, when it plans to join Sterling in a penthouse suite above the Chelsea facility.